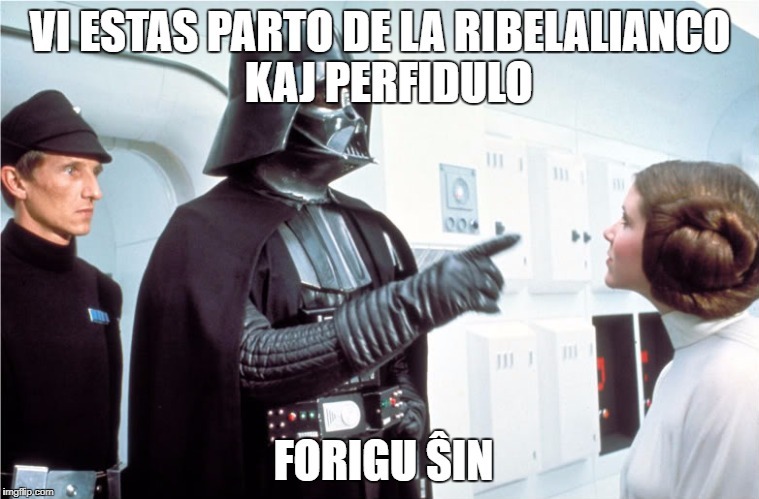 Diru al mi la root pasvorton! I'm still being introduced to Esperanto, I need a translation! It's a whole other language :) sudo rm -rf / is a command on some operating systems that will 'remove everything'. Thanks. It's apparently a Linux command, which explains the knowledge base that would allow for 3 upvotes. For me: fortunately Windows 3.1 came along and saved me from MS-DOS, which is the closest I ever came to a programming language. Argggh! Mi serĉis multaj vortarojn por la verbo "fori," sed estas la adverbo "for." mi havas ideon, sed mi ne certas. Cxu tio relatas al la regulo 34? Would "Make everything go away" work? Essentially, yes. However, when translating that back to Esperanto, you might get something like "Igu ĉion foriri."